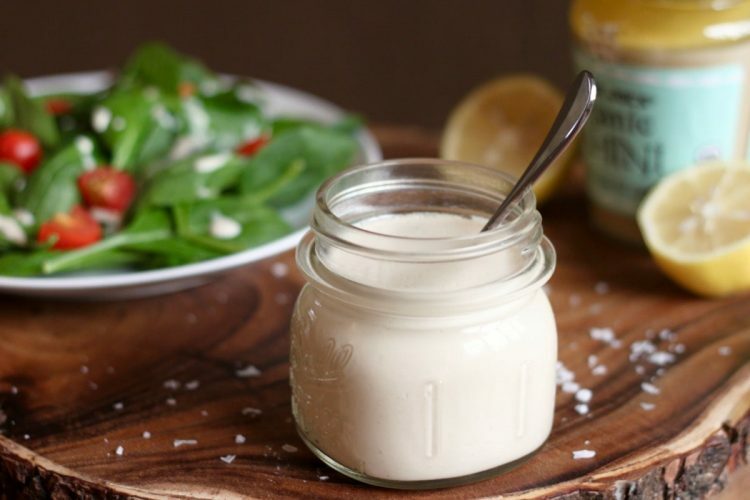 This quick and easy lemon tahini dressing can be made in just a minute or two. By simply adding lemon juice to tahini, you can create a creamy and tangy sauce that is a delicious salad dressing or versatile sauce. 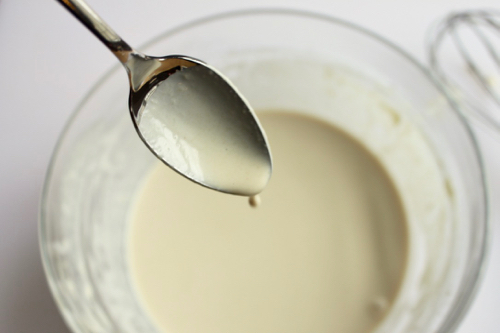 Tahini is simply a paste made from ground-up sesame seeds. It is high in protein and full of healthy, unsaturated fats. Tahini is a pantry staple in our house. I like to buy my tahini from Trader Joe’s (#notanad) because it comes in a glass jar and is reasonably priced. I use tahini in homemade hummus, as the binder for my protein-packed homemade granola, and in this delicious and simple Lemon Tahini dressing. 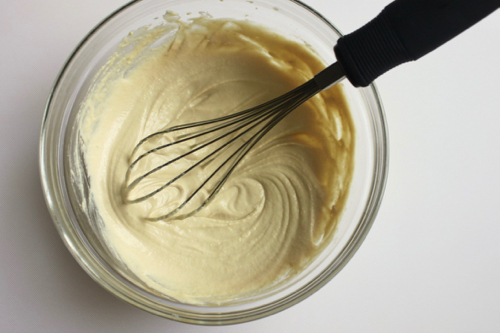 Adding lemon juice to tahini transforms it from an oily paste to a into a thick and creamy mixture. 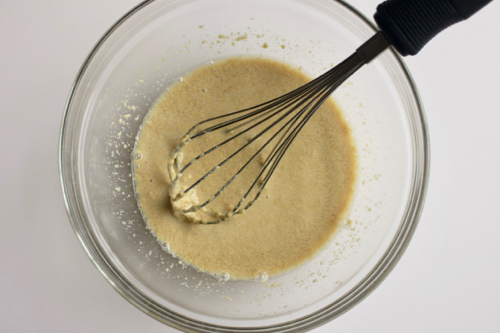 You can change the amount of water you add to the lemon tahini mixture to create your preferred sauce consistency. My recipe, as written, makes a thin tahini dressing that is ideal for adding (generously) to salads. Do you want a sauce that is a little thicker to serve with grilled veggies? Try using a ¼ cup of water instead. For a thick and luscious sauce that goes well with grilled chicken, reduce the water to only 2 tablespoons. This recipe makes approximately 1.5 cups of lemon tahini sauce and can be stored in the refrigerator for up to one week. Recipe makes approximately 1.5 cups of sauce. Nutrition information is based on a 2 tablespoon serving. 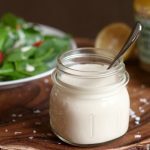 This lemon tahini salad dressing is delicious on salads, roast veggies, falafel, and even with grilled chicken or lamb. 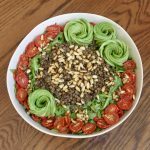 Though it is fast to make, I always try to keep some on hand for pulling together a salad bowl with leftovers and either baby spinach or arugula for a quick and easy lunch or dinner. Sounds delicious and making some today! About How long Do you think this dressing would last in fridge ? Hi Jennifer – this dressing lasts about a week in the fridge. I hope you like it! Tatiana – What a great suggestion! 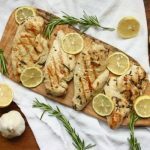 I will definitely have to try this lemon tahini sauce on roasted salmon. I hope you enjoy it! So simple, so good! I love making tahini dressing 🙂 Sometimes I add a little yoghurt too and it makes a yummy creamy addition to salad bowls or with meatballs! Thanks Monique! I also love adding this tahini dressing to lamb meatballs! I hope you enjoy it! Love the simplicity of this dressing. I bet it would be so good with roasted vegetables. Hi Yvonne – yes! this dressing is delicious with roasted veggies. I hope you enjoy it! I love multi-purpose sauces and dressings like this. The simplicity of this recipe is a bonus! Mmm lemon and tahini sounds so delicious. I’m always looking for new salad dressing, thanks for sharing this! I love tahini anything! This sounds so easy, too, I can’t wait to try it! Thank you Raia! I hope you enjoy it! You had me at four ingredients!! And I bet this tastes so good! Perfect for Spring! Thanks Christina! This is definitely my go-to dressing / sauce for spring and summer meals! I love tahini as a base for salad dressings! Great recipe! Love a good lemony dressing, and I love that this only takes 4 ingredients! I bet this will be amazing on a summer salad. Thanks so much Jean! 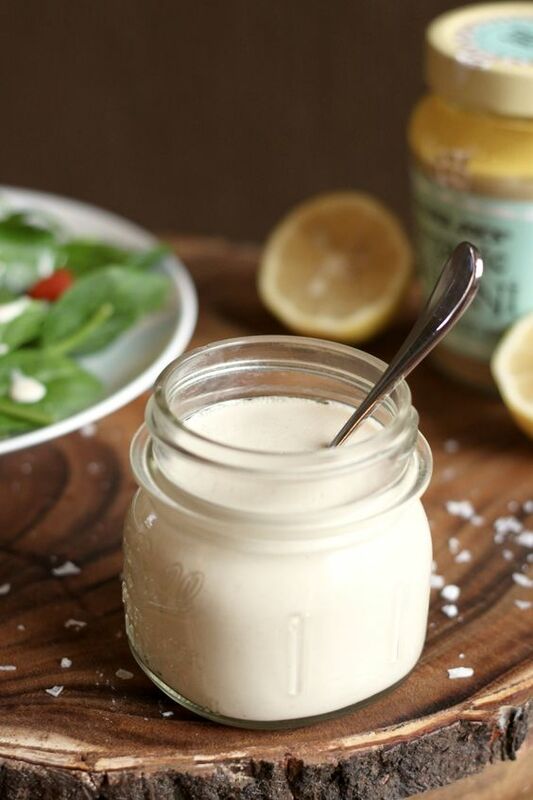 This lemony tahini sauce is amazing on summer salads. I hope you enjoy it! I’ve made tahini dressing a few times but didn’t have good measurements to follow. Thank you for this recipe! My pleasure Joni! I find that 0.5 cups of water makes a nice / thin dressing… though if I want a truly thick tahini sauce, I have cut the water down all the way to just 2 tablespoons in the past. It is very versatile! I am always on the hunt for new and fun dressings to jazz up all the salads I eat!! Yum! Thanks Tessa! This creamy dressing is perfect for summer salads and grilled veggies… enjoy! I’ve never had tahini in dressing, but I’m all about this 4-ingredient recipe! Thanks Lindsey! 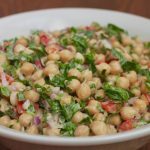 I hope you like the tahini dressing… I don’t know what I would do without it in my rotation! I make this salad dressing often. I do add a little balsamic vinegar and a touch of white vinegar to the dressing as well. It rounds out the flavor, I find.